Mexico blames the U.S. for arming the world's most powerful drug cartels, a complaint supported on Friday by a U.S. government report that found nearly all of Mexico's escalating drug killings involved weapons from north of the border. President Felipe Calderon and his top prosecutor told The Associated Press on Thursday that Mexican police and soldiers are dangerously outgunned because U.S. authorities are failing to stop the smuggling of high-powered weapons into Mexico. Calderon has complained for two years that the U.S. isn't carrying its weight in the cross-border drug war, despite the fact that American drug users fuel the problem. "We need to stop the flow of guns and weapons towards Mexico," President Calderon told AP. "Let me express to you that we've seized in this two years more than 25,000 weapons and guns, and more than 90 percent of them came from United States, and I'm talking from missiles launchers to machine guns and grenades." President Barack Obama's administration is beginning to respond. On Wednesday, U.S. Attorney General Eric Holder promised to enforce a long-ignored ban on importing assault weapons, many of which are re-sold illegally and smuggled into Mexico to resupply the cartels. Calderon applauded Holder's announcement saying it was the first time in many years that the American government was starting to show more commitment. When the U.S. enforced the assault weapons ban, only 21 percent of the weapons Mexico seized from traffickers were assault rifles, Eduardo Medina Mora, Mexico's Attorney General said. Today, it is more than half, and law enforcement officials are paying with their lives - some 800 have been killed in the past two years. Both Medina Mora and Calderon said the U.S. should aggressively enforce its gun laws and pressure sellers to keep weapons in the hands of law-abiding citizens. Homeland Security Secretary Janet Napolitano says every American has a stake in Mexico's war against murderous gangs, and acknowledges that violent drug cartels are now operating in many U.S. cities. Anderson Cooper reports Sunday, March 1. The U.S. State Department said on Friday that U.S.-purchased or stolen weapons account for 95 percent of Mexico's drug related killings, and that Mexican cartels are increasingly carrying out contract killings in the U.S.
Drug-related killings claimed 6,290 lives last year in Mexico - more than double the 2007 toll. And more than 1,000 have been killed so far this year. The violence is also spilling into the United States, with a sharp rise in kidnappings in Phoenix and cartels linked to gruesome murders all over the U.S.
Holder announced on Wednesday the Drug Enforcement Administration had rounded up 755 suspected Sinaloa cartel members and seized more than $59 million in drug money in the past 21 months. Congress is also paying attention. Lawmakers included $10 million in the economic stimulus package for Project Gunrunner, a federal crackdown on U.S. gun-trafficking networks. Mexican cartels often pay U.S. citizens to purchase assault rifles or other guns at gun shops, then sell them to a cartel representative at a U.S. gun show, where registration rules are much less stringent and the gun sale can't be easily traced. 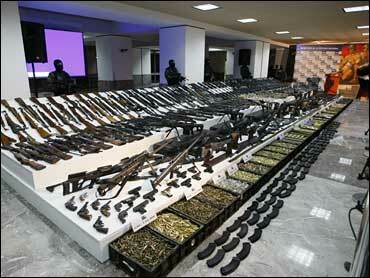 The Brookings Institution has estimated that 2,000 guns enter Mexico from the United States every day. The ATF says more than 7,700 guns sold in America were traced to Mexico last year, up from 3,300 the year before and about 2,100 in 2006. Cartels turn to the U.S. because Mexico's gun laws are relatively restrictive. Mexicans must get approval for a gun purchase from the Mexican defense department and are limited to guns with a calibre no higher than the standard .38-calibre. Larger calibres are considered military weapons and are off-limits to civilians. Cartels are so easily armed that their hitmen have used assault rifles as if they are disposable, tossing the weapons aside while fleeing assassinations. Mr. Obama said during his campaign that he respects Americans' Second Amendment right to bear arms, but favors "common sense" gun laws. Advocates on both sides of the U.S. gun control debate took that to mean new curbs on ownership of assault weapons and background checks at the gun shows that supply much of the cartels' arsenal. The U.S. actions follow a series of government reports warning that Mexico could melt into lawlessness if something isn't done. Calderon angrily denied that his country is in danger of becoming a failed state, telling the AP that his government has complete control of Mexican territory. But Mexico's leaders say they have no choice but to confront the cartels. Mexico's Economy Secretary Gerardo Ruiz Mateos said this month that if they don't defeat the traffickers, the country's next president could be a drug dealer. Canada issued an travel advisory Friday warning a surge in drug-related murders in certain areas of Mexico has heightened the risk of visiting the country. The Foreign Affairs Department has recommended Canadians to particular care when traveling of northern Mexico, especially around the border with the United States. Cities such as Tijuana and Ciudad Juarez are the epicenters of a bloody drug war between Mexico's main cartels. The Mexican government tripled its military presence in Ciudad Juarez this week. The deparment warns that firefights between soldiers and drug cartels can occur at any time, and travelers can get caught in the crossfire. The U.S. State Department recently issued a travel alert for Mexico, and has instructed its diplomats in Mexico not to travel to certain areas unless absolutely necessary.